What we’ve got going on in this photograph is that we’re testing the A-frame on the research vessel Atlantis after the A-frame’s re-assembly. The physical structure and the hydraulics have been upgraded to lift the upgraded, heavier Alvin. We’re trying to simulate the weight of the submarine and test the integrity of the A-frame and all its functions. We’re using weights and a spreader bar [the yellow tube]. 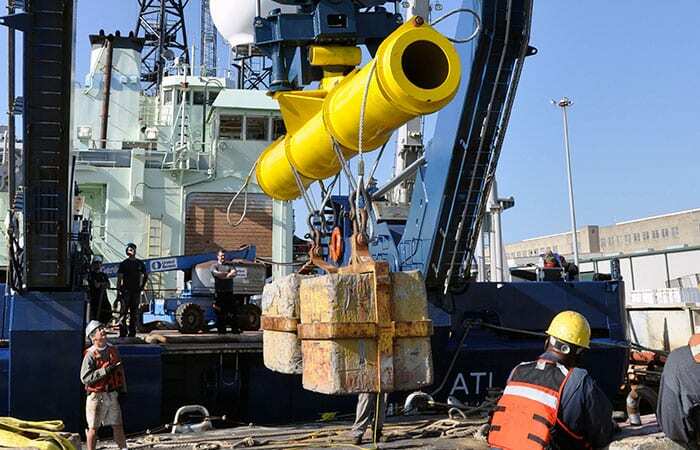 Actually, the spreader bar is called the “yellow submarine.” It’s an engineered piece of steel where we can apply weights at various areas and try to balance the distribution of the load longitudinally, as if it was the submarine. I’m the eyes. I’m just watching everything, to make sure all these functions work. I’m talking with chief engineer Christopher Morgan up in the doghouse [windows above and behind the yellow submarine]. That’s where the operator is for the A-frame during launch and recovery. We’re testing the main lift line and we’re testing the hook. On launch and recovery, when the A-frame goes in and out, the hook gets inserted into a “T” on the submarine, and that actually holds the weight. We’re also looking at the strain on the A-frame. Over to the right [out of view] there’s a gentleman and a rack of computers, and along the starboard leg of the A-frame are all these sensors called strain gauges. What they’re measuring is the strain on the A-frame as the weight was exercised on it. The ship was in drydock at Detyens Shipyard in Charleston, South Carolina, for cleaning and painting, and to complete the rebuild of the A-frame. At the shipyard, they test a lot of different crane systems, so they have all these various certified weights, so when you say, ‘We need this amount of weight,’ they can get all these together and you get the weight you want. In this photo there’s about 46,000 pounds. The Alvin’s going to be approximately 46-47,000 pounds. We started from zero weight so we could see the strain the A-frame went under when there’s no weight on it, just going back and forth. Then we slowly added weights in 25,000-pound increments, until we were up to 100,000 pounds. That’s about double the weight of the submarine, so what you’re doing is building in a factor of safety. The testing went on for at least five days. I was born and raised in this town, and I’m very proud to be working for WHOI and to be involved with this project. I’d like to see it come to fruition and be very successful.